Abstract: Myocardial ischemia is not commonly associated with infective endocarditis, but when it occurs in this setting, it is more frequently due to embolism from the vegetations or coexisting coronary artery disease. Even though aortic root abscess is a known complication of aortic valve endocarditis, coronary artery compression is an uncommon cause of myo-cardial infarction in these patients. Case presentation – We describe the case of a 48-year-old patient with infectious endocarditis of the mitral and aortic valve, with compression on both left anterior descending artery and circumflex artery due to a large aortic root abscess, causing myocardial ischemia and subsequent cardiogenic shock. These findings were suggested by transoesophageal echocardiography and cardiac computerized tomographic scan and were later confirmed on autopsy. 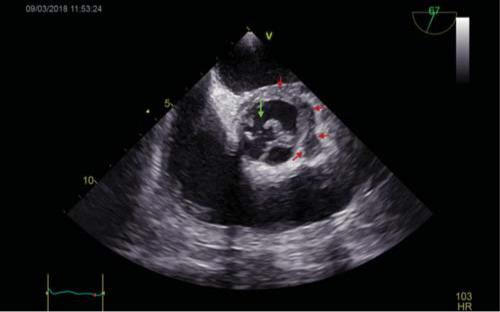 Conclusion – Finding the cause of myocardial ischemia in a patient with infective endocarditis can be very chal-lenging. 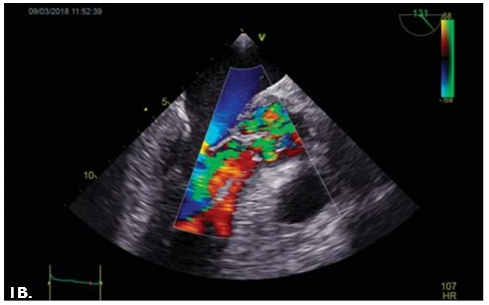 We emphasise the role of transoesophageal echocardiography, supported by cardiac computerized tomography for the diagnosis and management of these patients. Keywords: myocardial infarction, echocardiography, endocarditis. Rezumat: Ischemia miocardică nu se asociază în mod obişnuit cu endocardita infecţioasă, însă când apare în acest context este cauzată, cel mai frecvent, de embolizarea din vegetaţii sau de ateroscleroza coronariană preexistentă asociată. Deşi abcesul de radăcină aortică este o complicaţie cunoscută a endocarditei de valvă aortică, compresia coronariană extrinsecă este o cauză de infarct miocardic rar întâlnită la aceşti pacienţi. Prezentarea cazului – Descriem cazul unui pacient în vârstă de 48 de ani, cu endocardită infecţioasă de valvă mitrală şi aortică, complicată cu un anevrism de rădăcină aortică de dimensiuni mari cu compresiune pe segmentele proximale ale arterei interventriculare anterioare şi circumflexe, care a determinat ischemie miocardică şi ulterior şoc cardiogen. Diagnosticul a fost sugerat de ecocardiografia transesofagiană şi computer tomografie cardiacă şi confirmat de autopsie. Concluzie – Detectarea cauzei ischemiei miocardice la un pacient cu endocardită infecţioasă poate fi o provocare. Subliniem rolul ecografiei transesofagiene şi a computer tomografiei cardiace în diagnosticul şi conduita terapeutică a acestor pacienţi. Cuvinte cheie: infarct miocardic, ecocardiografie, endocardită. Acute coronary syndromes in patients with infective endocarditis are usually a result of embolism from vegetations, or could be caused by preexisting coronary artery disease, which becomes apparent during active infection. Other possible mechanisms involved in the occurrence of myocardial ischemia in these patients are represented by the obstruction of the coronary ostium due to a large vegetation, severe aortic valve regurgitation causing ischemia due to reduced perfusion pressure followed by decreased coronary reserve and more rarely, external coronary artery compre-ssion due to major periannular abscess formation1. Infective endocarditis with subsequent aortic valve complications causing myocardial ischemia is a very rare life threatening condition. We describe the case of a 48-year-old patient with infectious endocarditis of the mitral and aortic valve, whose left anterior des-cending coronary artery (LAD) and circumflex artery (CX) were compressed by a large abscess of the aor-tic root, causing myocardial ischemia and cardiogenic shock. These findings were suggested by transoeso-phageal echocardiography (TOE) and cardiac computerized tomographic scan (CT) and were later confirmed by autopsy. A 48-year-old male patient was admitted to our hospital with acute chest pain lasting for 2 hours. The patient had a 2-week history of intermittent fever up to 39°C, dyspnea and sweating. There was also a history of recent dental treatment one month before, with multiple teeth extraction. At the age of 30 he had a subtotal gastrectomy for gastric ulcer. There were no risk factors of coronary artery disease. Physical examination on admission revealed a temperature of 38°C, a pulse rate of 100 bpm and blood pressure of 100/60mmHg. The skin was pale, without any periphe-ral signs of endocarditis. There was a systolic ejection murmur (grade 2/6) and a diastolic murmur (grade 4/6) in the aortic area. There was a moderate pain-ful splenomegaly. The lungs were clear and there was no peripheral edema. The resting electrocardiogram showed left ventricular hypertrophy and 1 mm depre-ssion of the ST segment in DI, aVL, V5 and V6. The chest X-Ray revealed mild cardiomegaly and normal pulmonary vascular markings. The hemoglobin level was 12 g/dl, with mean cell volume of 88 fL, white cell count of 30.000/uL, platelets of 289.000/uL, C-reacti-ve protein 327 mg/dl, erythrocyte sedimentation rate of 90 mm/hour, presepsin of 554 pg/ml. Three sets of blood cultures were ordered and cardiac enzymes were signifi cantly elevated (high sensitive Troponin T of 2.6 ng/ml, creatinkinase of 1380 UI/L, creatinkinase – MB of 240 UI/L). 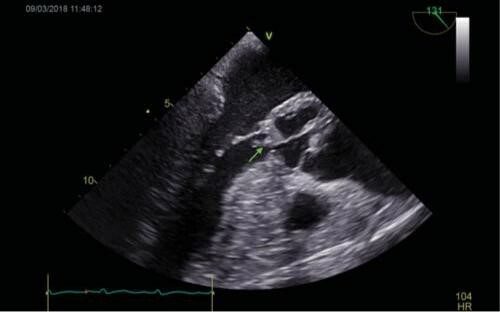 Transthoracic echocardiography with suboptimal windows revealed a non-dilated left ventricle, with global hypokinesia and mildly reduced systolic functi-on. The aortic valve was severely calcified, with a ve-getation at the level of the left coronary cusp (LCC). A hyperechogenic mass, highly suggestive of an abscess, was surrounding the aortic root. Empirical antibiotherapy with Ampicillin 12g/day, Oxacillin 12g/day and Gentamicin 240mg/day was initiated and later replaced with Vancomycin after blood cultures became po-sitive for methicillin-resistant Staphylococcus Aureus. Treatment with dual antiplatelet therapy and Heparin according to the non-ST-elevation myocardial infarction was associated. 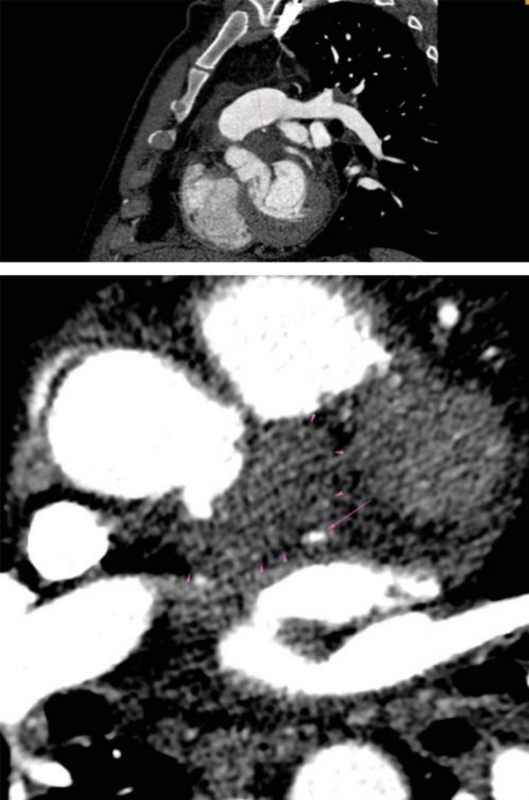 A subsequent TOE was afterwards performed, with visualization of a heavily calcifi ed aortic valve with thickened cusps, severe aortic regurgitation and a ve-getation measuring 10 mm in length at the level of the LCC (Figure 1). Moreover, the LCC was perforated. Examination of the aortic root visualized an abscess located on its posterior and lateral sides, containing 2 cavities measuring 18mm and 10mm (Figure 2), witho-ut visible fistula connecting the aortic root to the pul-monary artery trunk. Furthermore, inspection of the mitral valve revealed a second vegetation at this level, measuring 18mm in length, which was visible on the atrial side of the anterior mitral cusp (Figure 3). There was an associated moderate mitral regurgitation. 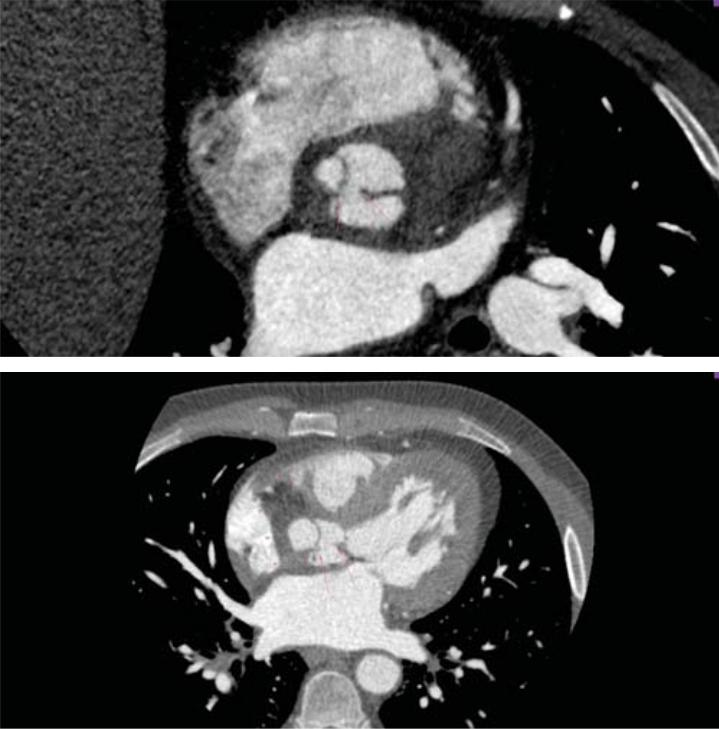 In order to determine the cause of myocardial ischemia in this setting and the extension of the peri-valvular abscess, a cardiac CT was next performed. There was no sign of atherosclerosis at the level of the coronary arteries, but subendocardial ischemia was visible in up to 50% of the inferior and anterior left ventricular walls (Figure 4). The perforation of the LCC was confirmed and it extended on a distance of 4 mm. The abscess surrounding the aortic root was also confirmed, located on the posterior and lateral sides of the aortic root, with extension from the pulmonary infundibulum (10mm distance from the right coronary artery) to the junction between the superior vena cava and the right atrium (Figure 5). The proximal segments of the LAD and CX were narrowed due to the large abscess compressing the two arteries (Figure 6). There were also multiple abscesses in the spleen. A heart team including a cardiologist, an infectious disease specialist, a cardiac surgeon and an anesthesi-ologist decided that an emergency surgery should be performed. While preparing the operation, the pati-ent became hemodynamically unstable and required inotropic support. Shortly after, he suffered a cardiac arrest, which was unresponsive to resuscitation maneuvers. At autopsy, a large aortic ring abscess was found, with a perforated LCC and large vegetations at the level of the aortic and mitral valve, confirming the TOE and CT scan results. The primary etiology of the narrowing of LAD and CX was the surrounding inflammation, which compressed the arteries. The most likely cause of death in this patient was heart failure, more probably due to severe compromise of the co-ronary circulation by extrinsic compression of a large abscess cavity. Figure 1. TOE: Long axis mid-esophageal view of the aortic valve. 1A. Visualization of a vegetation measuring 10 mm at the level of the LCC (ar-row). 1B. Severe aortic regurgitation. TOE=transoesophageal echocardiography, LCC=left coronary cusp. Figure 2. TOE: Short axis mid-esophageal view of the aortic valve. Visu-alization of the perforated LCC (green arrow) and of the aortic root abscess (red arrow), which contains 2 cavities, located on the posterior and lateral sides of the aortic root. TOE=transoesophageal echocardiography, LCC=left coronary cusp. Figure 3. TOE: Long axis mid-esophageal view of the mitral valve: Visualization of a vegetation on the atrial side of the anterior mitral cusp, measuring 18mm (arrow). TOE=transoesophageal echocardiography. Figure 4. Cardiac CT-scan: subendocardial hypoperfusion of the anterior and inferior left ventricular walls (arrows). Figure 5. Cardiac CT-scan: 5A. Perforation of the LCC, extended on a distance of 4 mm (arrow). 5B. Abscess surrounding the aortic root (arrowhead) and perforation of the LCC (arrow). LCC=left coronary cusp. Despite the current medical and surgical treatment of endocarditis, mortality still remains high, primarily because of heart failure due to acute aortic regurgitation and perivalvular complications1. At present, myocardial ischemia is an uncommon complication in these patients. It usually occurs in the fi rst 2 weeks and is more frequently associated with virulent micro-organisms, severe regurgitation and large periannular aneurysms2. Several mechanisms responsible for myocardial ischemia have been described, such as coro-nary embolism, obstruction of the coronary ostium due to a large vegetation, coexistence of preexistent coronary lesions, severe regurgitation and coronary compression secondary to the presence of major periannular complications3. Even though coronary angiography is considered a safe procedure in patients with infective endocarditis by some investigators, there still remains a risk of dislodgement of fragments from the vegetation when the catheter comes in contact with the valve. 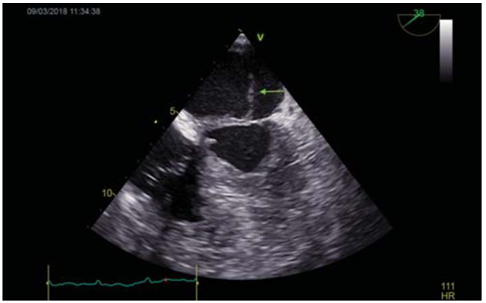 Therefore, the initial diagnostic procedure in our patient with infective endocarditis and myocar-dial ischemia was TOE, which is able to define the ex-tent of the perivalvular abscess. In order to evaluate the cause of myocardial ischemia, a cardiac CT-scan was performed and the mechanism of myocardial in-farction was suggested by the appearance of the coronary arteries, which were narrowed in their proximal segments. 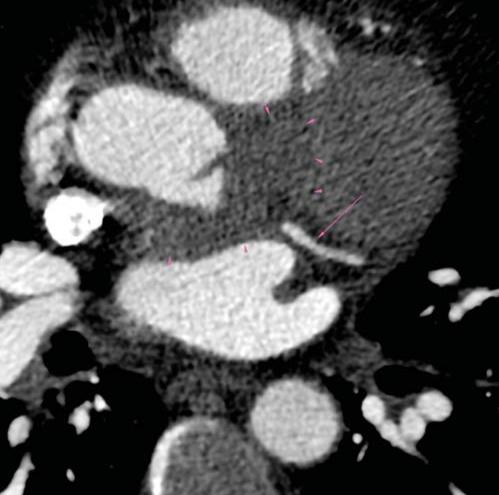 The narrowing of the LAD and CX seen in our case was due to mass effect because of the external compression of the abscess and not due to atherosclerotic heart disease. There were only a few cases reported in literature, where the morphology of the coronary lesion was suggestive for mass effect, with visualization of a smooth eccentric narrowing of the coronary arteries wall, suggestive of extrinsic compression4-6. In conclusion, extrinsic coronary compression may be overlooked as a mechanism of acute myocardial infarction in a patient with infective endocarditis. We outline the role of imagistic techniques in evaluating the extent of perivalvular complications and finding the mechanism responsible of an associated acute coronary syndrome. Figure 6. CT-scan: 6A. Compression of LAD artery – proximal segment (arrow) by the abscess (arrowhead). 6B. Compression of CX artery – proximal segment (arrow) by the abscess (arrowhead). 6C. No compres-sion of CX artery in the middle segment (arrow) bellow the abscess (arrowhead). LAD=left anterior descending, CX=circumflex. 1. Habib G, Lancellotti P, Antunes MJ, Bongiorni MG, Casalta JP, Del Zotti F, Dulgheru R, El Khoury G, Erba PA, Iung B, Miro JM, Mulder BJ, Plonska-Gosciniak E, Price S, Roos-Hesselink J, Snygg-Martin S, Thuny F, Mas PT, Vilacosta I, Zamorano JL, ESC Scientific Document Group; 2015 ESC Guidelines for the management of infective endo-carditis: The Task Force for the Management of Infective Endocar-ditis of the European Society of Cardiology (ESC). Endorsed by: Eu-ropean Association for Cardio-Thoracic Surgery (EACTS), the Eu-ropean Association of Nuclear Medicine (EANM), European Heart Journal 2015;36(44):3075–128. 2. Manzano MC, Vilacosta I, San Román J, Aragoncillo P, Sarriá C, López D, López J, Revilla A, Manchado R, Hernández R, Rodríguez E. Acute Coronary Syndrome in Infective Endocarditis. Rev Esp Car-diol. 2007;60(1):24-31. 3. Clarke NRA, Forfar JC. Aortic root abscess presenting as unsta-ble angina due to extrinsic compression of the left coronary artery. Postgrad Med J 2002;78:168–69. 4. Cripps T, Guvendik L. Coronary artery compression caused by ab-scess formation in infective endocarditis. Int J Cardiol 1987;14:99– 102. 6. Wickline XL, Goli VD, Buell JC. Coronary artery narrowing due to extrinsic compression by myocardial abscess. Cathet Cardiovasc Diagn 1991;23:121–3.